Do you have a herniated disc, multiple herniated discs, degenerative disc disease, facet syndrome, or any other type of spinal problem that you thought needed surgery? Arsenault Chiropractic Center offers non-surgical spinal decompression to help you heal these conditions. Spinal decompression is FDA approved and has been clinically proven with an 86% success rate with the pain and symptoms associated with herniated and/or bulging discs, even after failed surgery. 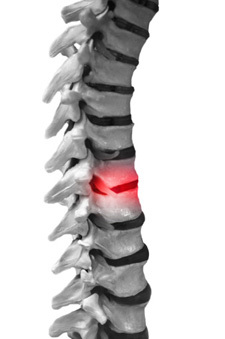 Spinal decompression therapy effectively relieves the pain and disability resulting from disc injury and degeneration by repairing damaged discs. After lying on the comfortable spinal decompression bed, you will be fitted with an automatic shoulder support system. The automatic shoulder support system helps to stabilize your upper body. The advanced computer system automatically adjusts to your specific needs. The spinal decompression computer simulates an anti-gravity effect on your back that helps herniated material return to its normal position and stop the pain. Patients describe the treatment as gentle, painless, intermittent pulling of your back. Many patients actually fall asleep during treatment! Patients typically undergo 15 to 40 treatment sessions. Each treatment lasts between 30-45 minutes. This, of course, depends on your individual case and is determined by a thorough evaluation. Following each session, a cold pack and electric muscle stimulation may be applied to help pain relief and speed the healing process. It is important to note that many patients get substantial, immediate relief after just a few treatments.